Performance artist and storyteller Sheldon Scott. Photo courtesy of Tony Hitchcock Photography, used with permission. Performance artist and storyteller Sheldon Scott performs 'A Man Ain't Nothin' But A Man' at (e)merge art fair. The District of Columbia has a governor. While that statement may conjure a quizzical gaze, growing circles in the know understand that it has nothing to do with a political coup. "The Governor of U Street," a.k.a. Sheldon Scott, is a performance artist whose growing buzz within the D.C. arts scene is contributing to an uprising of another kind. The 38-year-old native of South Carolina is leading the charge for performance artistry in the nation's capital—and doing so with an unapologetic point of view that's as counterculture as his nickname. Remember those warm and fuzzy childhood fables that stuck with you long into adulthood? Scott, whose work is inspired by such American folklore, unflinchingly shatters those fantastical veneers to reveal what he feels is a subconscious programming. "You operate under subliminal conditioning," Scott says of these stories of old. And he should know. A trained psychotherapist turned-artist/storyteller, he has an expert opinion." So what is this subliminal conditioning? In his installation entitled "Folk'Lore," Scott challenges the legendary story of black folk hero John Henry whose extraordinary prowess as a hammer-wielding steel-driver is put to the test in a man vs. machine race against a steam-powered hammer. Henry wins the contest, only to die later when his heart gives out. Sure, Henry was praised for his power, but he is treated like a race horse of sorts. An oddity used for mere entertainment. Sound similar to a sport where phenomenally-sized, predominantly black—but admittedly very well-paid—men race up and down the court to the amusement of cheering crowds? These are examples of what Scott calls "the exceptionality of the black male form." An objectification and exploitation of the black male body which subliminally underscores the psyche of American culture. John Henry was paraded and worked until his very life was totally depleted. He was an expendable vessel, and Scott makes the connection back to the days of slavery when the bodies of black males were showcased and sold, only to be worked until their lives were used up, or taken outright. The scourge of slavery is a theme that reverberates throughout the installations in Scott's northwest studio, which acts as a pit stop for his works. Large framed studio photos capture the narratives of his works, while individual components—from an authentic 1800's hammer from "Folk'Lore," to a Brazil nut, to a cement boulder—lay like a collection of treasures, each communicating the artist's bold vision. Scott's photographed pieces are in high demand and travel regularly. 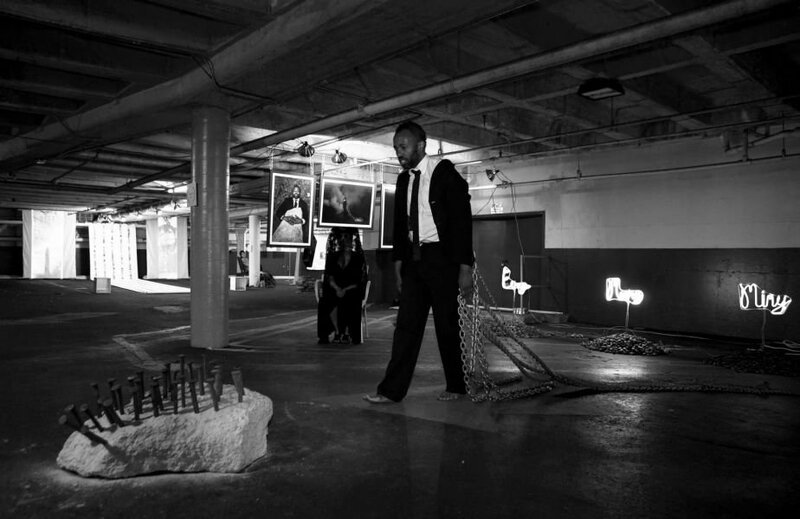 Most recently, photos from his installation "Level With Me" were showcased in an exhibit at Delaware State University in early November 2014. "They can't always live with me," the artist says of his works. And they don't. One of Scott's regular buyers had just stopped by his studio to lay claim to one of his pieces. But the artist's popularity didn't occur overnight. In 2005, Scott began his artistic career storytelling with SpeakEasy DC and local venues like Busboys and Poets. His performance art became an extension of that expression. Scott seems to follow those artistic instincts wherever they may lead him. In fact, he has been a model for popular D.C. clothier Hugh & Crye and recently sported gear by Public School for the cover of the Washington Post Magazine. He is very much into fashion and always performs his installations wearing his signature black suit. Scott's increasing ubiquity is evidence that the scope of his talents are not easily defined. Asked to finish the sentence, "Sheldon Scott is..." He paused for an extended period. He is very seldom speechless. He's still searching for the answer.